jwboatdesigns: Summertime, and the consequences of not doing the maintenance while the winter weather prevented sailing. Being summertime here, I’m pining for the Fiords . Oops, not quite. Monty Python has a lot to answer for. Really though I’m wanting to go sailing, cruising in a boat that has enough space in its cabin to be halfway comfortable, in a boat capable enough to do some exploring, and which pleases me to own. I bought the little gaff sloop “May” some years ago, sailed her quite a lot for a while before moving aboard my ship. 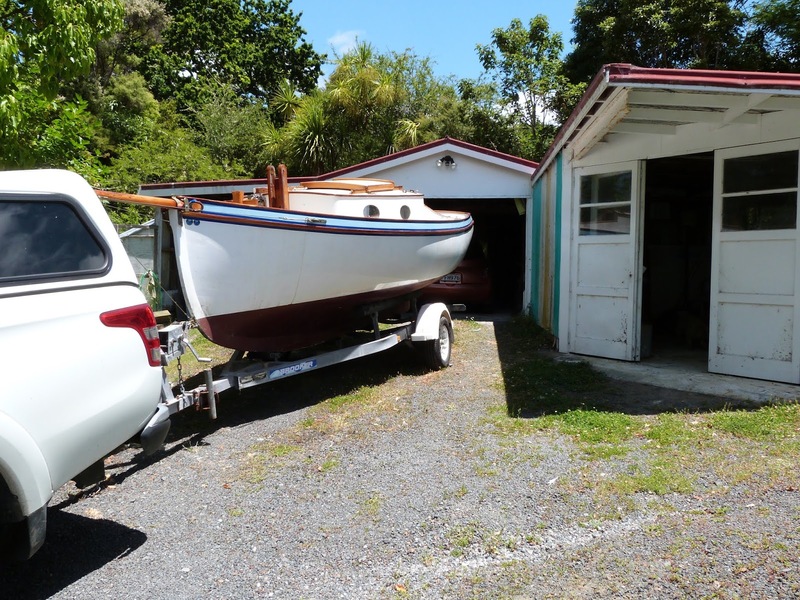 Life got busy so May went under a cover, and stayed there until a few months ago, but the need to go sailing got to me and I hauled the covers off her to find, as expected, several years of deferred maintenance awaiting me. At the same time, I wasn't that enamoured of her name. I had to remove the old name from her transom to get the old brightwork off, so this was the opportunity. She's synonymous with small, adventurous mischief, tough like a little terrier dog, and can ghost along when the smoke from a fire on the beach is rising straight up. So she's got a new name, she's "Spook" of Stillwater. The new name has been affixed to her transom so its official. I’ve said it before, and will say it again, “this is the summer of the paintbrush”, and so it is. I’ve been stripping old, peeling varnish, I suspect that its 2 part polyurethane as it is a stinker to sand, so it’s a scraper job rather than sanding. I’ve been able to scrape and sand out some of the water stains in the Eucalyptus wood trim, have gone through three rolls of Bear brand exterior 14 day masking tape, half a litre of Goldspar marine varnish, touched up some of the white paint, painted and varnished the mast, boom and yard, scrubbed the sails and taken every bit of rigging and cordage off her. I’ve also stripped the interior, taken the ground tackle off, all the cruising gear, charts, stove and all the containers for the galley stores are out. She’s only 18 ft on deck, but gosh, there was a lot of stuff inside her, Its all spread out on the garage floor right now and I’m wondering what magical spell allowed me to put all of it away inside that small space. But I’m almost done, there are some mods needed to get that trailer right, the boat tends not to come up the middle of the rollers so I’m having to carry a trolley jack to move her over before I tie her down to tow the rig away, so that’s needing attention. There is more,. Way back Howard Rice and I worked out a reboarding system we called the “sling” for getting back aboard a SCAMP. I’d had a pair of short strops with a foot loop in the end, secured on the stern mooring cleats and accessible through the fairlead openings. I could get back aboard, but it was a struggle, so I’m putting a “sling” on each side. In this case the freeboard is only very slightly more than the SCAMP and I’m sure it will work. I’ve still got lots of little tasks to do, I’ve sponged out the interior, aired the cushions, replaced the valves in the big bilge pump, scrubbed the sails and replaced the mast lashings. Another job will be to replace the fire extinguisher which is still ok for pressure but the handle is very rusted. I’m planning to take that to Daughters house and start a fire ( outside, I said OUTSIDE!) then get the granddaughters together and give a lesson on how to use one. Hopefully they’ll never need to use that lesson. The boat will get a new one. I’m also planning to put a simple electrical system in, a small solar panel, a car battery, a couple of LED cabin lights and an anchor light. The rules say that for a vessel under 7 m long, not under power, when under way at night, a big torch is legal. I’ve three ready to go on board. A big spotlight flashing in someones face gets their attention much more quickly than a couple of tiny, dim navigation lights. The electrical system will include USB points to recharge phone, vhf, laptop and camera. We’ve become very “connected” these days and its hard to do without. I’m building a new lightboard too, that hooks up to the tow vehicle and mimics the tail and signal lights of the tow wagon. The old one was perfectly satisfactory but it had been sitting out in the weather for so long its rotted away, and the lenses on the lights crazed and cracked. I just wanted to go sailing, so far its been five days of solid work, I’m expecting to be close to ready in a couple more days and hope to give her a shakedown daysail about Friday 11th. There is a small group planning a cruise in the Bay of Islands mid February, and I’m hoping to be there. I’d better get that paintbrush working again. You cant really see it, but there is a great deal of masking tape on there, darker blue than the topside cove stripe paint. She's only little but there is a lot of varnished trim on her. It does look nice but its a lot of work to keep up. "Spook" is looking gorgeous, John. Brightwork may be a bit of extra work, but the payback is immense. It's such a pleasure to lounge in the cockpit and to be able to admire the wood, glowing through the varnish. If you spend much time on the boat - and I'm sure you will this summer - the satisfaction is well worth the labour put in. I hope your cruise in company to BOI goes well.Shame it's such a detour to Whangarei! You'll see me parked outside your hacienda, it would be just about the right place to stop for a cuppa on the way north, towing her on the trailer of course. Sometimes you look at something and think that makes sense. 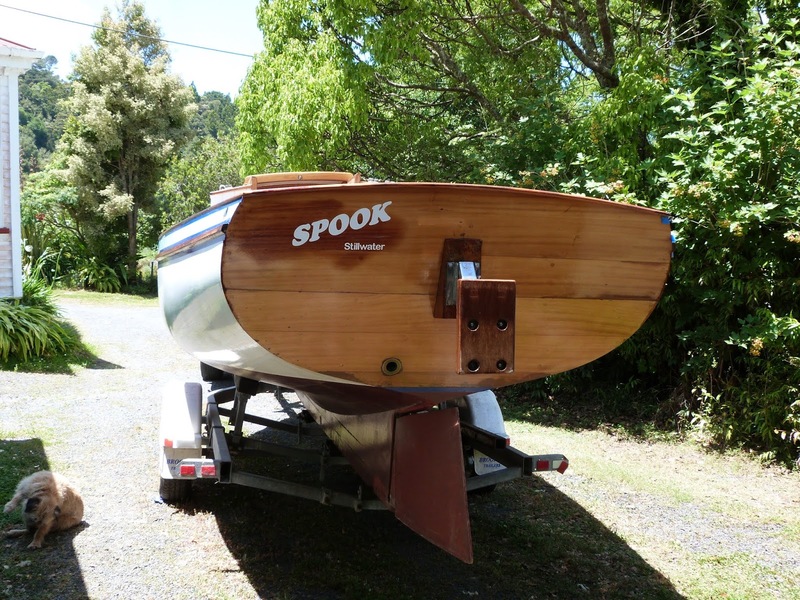 Spook makes sense, can't wait to see her rigged and back in her natural habitat. Thanks and keep sharing such valuable updates through your side. Hello John, Spook is looking very good indeed, nice work. If you wouldn't mind a question about another boat? I purchased plans for your Navigator about 2 years ago and shamefully only just started in on it. I am going to try to do this in sail and oar fashion without an outboard. I am retired and have much more time than money so I'm not in a hurry. My question is where would be the best location for the oarlocks, I don't see then on the plans, and how long of a sweep should I use? I'm 68 yrs, 6'2" and still have a pulse and a heartbeat so I should be able to get around reasonably well. Main sailing area is St Andrews bay in the Florida panhandle for now. Thanks for your time and thanks for a truly beautiful design.